The high-tech, multi-purpose Phyto-Sourcils Design provides colour, skincare and precision thanks to its 3-in-1 pencil specially designed to give professional make-up results in three steps. The result: restructured brows for redefined, radiant eyes and a structured face. Phyto-Sourcils Design provides a skincare formula tested under ophthalmological control. Enriched with protective, softening Acacia wax and nourishing Camellia oil, Phyto-Sourcils Design takes care of brows. Film-forming Carnauba wax coats brows to give a precise line. 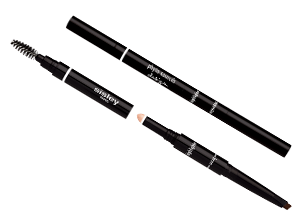 The pencil texture is soft and powdery for a line with a dry, matt finish that stays soft. Brows grow softer with every application. 1/ Brush brows upwards with the taming brush. 2/ Using the triangular pencil tip, redraw, shape and fill in. Blend in by brushing in the direction of growth to the tip of the brow. 3/ Add a touch of highlighter under the arch of the brow to illuminate the eyes. Effortless brows in 3 steps.No need to buy these products separately when theres everything you need for your brows in one tool.